The demand for satellite technologies within the Department of Defense (DoD) is continuing to grow even as the DoD draws down its responsibilities in Iraq and Afghanistan. Commanders want to put more information in the hands of soldiers, while greater reliance on remotely piloted aircrafts (RPAs) is requiring more real-time data streams than ever before. Last year, according to DoD estimates, RPAs over Afghanistan collected the equivalent of more than 700 years of video. To fulfill this demand in the short term, the DoD has been turning to commercial satellite providers, which today fulfills approximately 80 percent of the agencys SATCOM needs. In the long-term, the DoD is looking towards a new satellite constellation in the Wideband Global SATCOM System (WGS) to balance its wideband demand. WGS is currently a constellation of four satellites in geostationary orbit, but the DoD has plans to launch six more satellites over the coming years. However, even with the full network operational, WGS will only satisfy 50 to 60 percent of the projected military satellite communications needs of the DoD through 2025. More capacity is critical, and thats where commercial technologies come in. At Hughes, our commercial satellite technologies use advanced bandwidth efficiency techniques that can maximize a satellites output. Applying these proven techniques to the management of the WGS system, the DoD can effectively increase capacity by 20 percent, resulting in cost savings by increasing capacity and bandwidth usage without requiring additional resources. The way that satellite data is coded has a major impact on bandwidth use. For example, advanced information coding schemes can transmit four times as much data per second as legacy modem implementations. In the case of satellite, using more efficient coding can make a tremendous difference, especially when the WGS must increase its signal to overcome rain, clouds or radio interference. Today, in circumstances such as these, the WGS effectively fences 10 times more resources to overcome adverse conditions compared to whats required for normal clear-weather operations, which is far more than is necessary. Together with adaptive power and resource control, more robust coding schemes can significantly improve bandwidth efficiency. 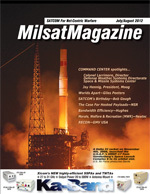 In 2009, the DoD cancelled the Transformational Satellite Communications System (TSAT) program including the TSAT Mission Operations Segment (TMOS), leaving the WGS satellite system as DoDs primary means to satisfy wideband communications needs. Additionally, the cancellation of the TMOS left DoD without a unified network management program. The DoD will continue to rely on an ad-hoc network operations approach, which will mean that routine changes to configuration, software upgrades and performance measurements cannot be automatically managed from a Network Operations Center (NOC) or even a remote site. Instead, the DoD continues to manually troubleshoot and then deploy subject matter experts to the operational theater. An automated management system could reduce this burden by facilitating remote operations. Satellite capacity requirements are variable as efforts shift from one mission or theater to another. Unfortunately, many of todays WGS-based networks lack flexibility to allocate resources in the same way. They rely on dedicated communication circuits that were set up manually, meaning that even if a user has excess capacity, it is unavailable to others on the network. Communications veterans may recognize this as a throwback to the old circuit-based networks that were used before modern Internet Protocol (IP) packet-based switching. By implementing dynamic resource allocation, WGS can allocate unused bandwidth across the system, increasing overall capacity and making it available where needed. When a high-priority user needs more, these resources can be dynamically re-allocated consistent with a customized priority and precedence-scheme. All three of these technologies are already widely used in commercially-proven solutions from Hughes. Applying these same best practices across the WGS will have a dramatic positive effect on capacity. And, it can all be done on the ground with no impact to the 10 WGS satellites DoD has procuredall without launching a single rocket.